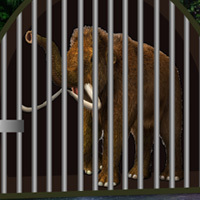 BigEscapeGames - Big Mammoth Land Escape is an escape game developed by Big Escape Games. A big escape game with tough puzzles. In this game, you came to see the beauty of a Mammoth land. But unfortunately, you noticed that someone trapped a mammoth in a cage. There is no one to help the mammoth. You have to find the way to rescue the mammoth from there by finding useful objects, hints and solving puzzle. Click on the objects to interact with them and solve puzzles. Good Luck Have Fun! For color-dots grid, just link squares with dots of same color. In the second set of scenes, the hint for the circle with 13 smaller circles is opposite/negative (dark=light and light=dark). Lbh trg 3 uvagf: n qnex terra bar, n qnex erq bar naq n oevtug terra bar. Sbe gur qnex uvagf: purpx gur oynpx obkrf, sbe gur oevtug bar: purpx gur terra obkrf. Only one hint needed for the 4x3 grid with arrows in the far left scene in the third set of scenes. Thanks for the 3x2 hint - does anyone understand WHY that is the solution?! I have no idea. Have not seen any hints for how te use. Got completely stuck there and had to look at the walkthrough for the right solution. Could someone please do a plain english spoiler for the 3x2 column boxes??? rot13 is really easy to use. Think of it as a puzzle challenge. I usually don't use it. But it's not hard to use. Right under the "Post a Comment" there's a blue line saying "Rot13 Converter" Just click that, copy/paste the text in the window and press the button. I did not want to openly spoil that puzzle that early in the comments. Thanks! I never saw that. People wanting help/hints isn't necessarily the same as wanting spoilers. Nearly everyone gets stuck now and then. Blatant spoilers can ruin a game for many. I am really pleased and grateful that in the past few months, most make an effort to avoid posting blatant spoilers. Using rot13 takes seconds and really is a minor inconvenience.